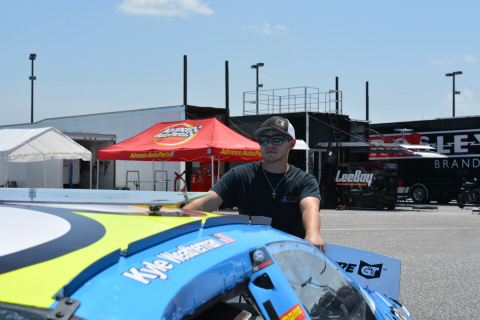 Kyle Weatherman, driver of the Lira Motorsports No. 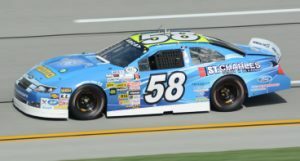 58 St. Charles Glass Ford Fusion, avoided several multi-car crashes and survived to a top-15 finish on Friday in the General Tire 200 at Talladega Superspeedway in the ARCA Racing Series presented by Menards. Expected to be a championship contender at the start of the season, Weatherman knew he simply needed to escape Central Alabama with a top-15 and succeeded with a 12th place run. Running inside the top-10 on the final restart, Weatherman pulled out to the outside line with teammate Sheldon Creed. They received no help on the top line and it cost them several positions, but Weatherman was pleased with the result. On the final restart, Weatherman followed his teammate Creed to the top line in hopes that they could get some drafting help on the back straightaway to move to the front of the pack. “Working with Sheldon is a lot of fun. Having a teammate that has your back no matter what and someone you can trust to go with you is vital. I think we could have done a few spots better, but all-in-all, had a good points day and the car is still in one piece,” Weatherman said. Weatherman credits his crew chief, Sam Schram, with a lot of his successes so far this season. Kyle would like to thank St. Charles Glass and Glazing, MOMO Motorsport, Fresh Water, TraqGear, Safecraft, and NexGen Fuels for being a part of his team. He also would like to thank Carlos and Amanda for allowing him to be behind the wheel of the No. 58 machine. About St. Charles Glass and Glazing: St. Charles Glass and Glazing is a full-service glass and glazing company that is based out of St. Louis, MO. They specialize in all-things glass and glazing ranging from simple window installation to complex commercial projects. About Lira Motorsport: Lira Motorsports is a multi-car, multi series race team owned by Carlos and Amanda Lira. The team competes in the ARCA Racing Series, NASCAR Camping World Truck Series, NASCAR Whelen All- American Late Model, and IMSA Sportscar events nationwide. Lira Motorsports’ ARCA and NASCAR Truck programs are operated from an 18,000 square foot shop in Mooresville, North Carolina, and the late model team operates from a 12,000 square foot facility in Port Orange, Florida, just minutes from Daytona International Speedway.